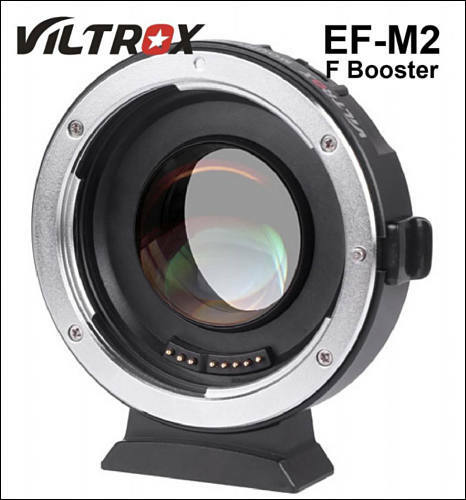 Viltrox EF-M2 Electronic Adapter (F Booster) is designed for Micro Four Third cameras and Canon EF mount lenses. EF-M2 has built in optics to increase light input by one F stop and reduce focal length by x0.71. EF-M2 also comes with USB port for firmware update and a dedicated button to adjust aperture. 4 elements in 4 groups optics increase light input by one F stop and also reduce focal length by x0.71. Record EXIF data includes aperture, focal distance etc. High precision galvanized alloy with chromium plating on both mounting surface to ensure smooth installation and durability.